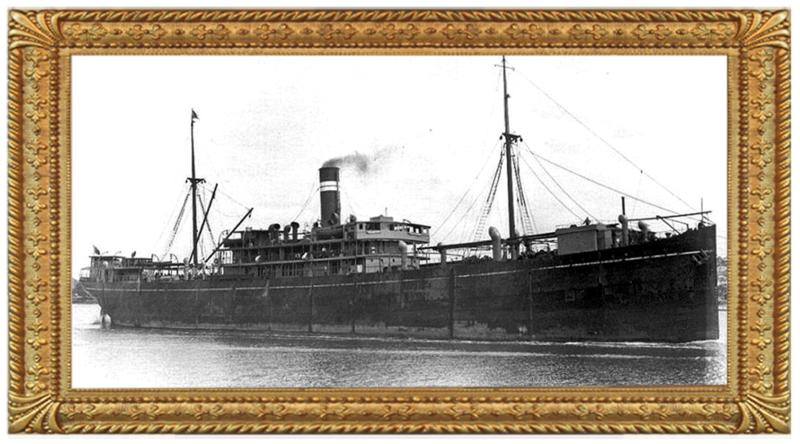 Passenger/cargo steamship built for Archibald Currie & Co's Australian and Indian Line, Melbourne in 1910. Employed on the Melbourne - Calcutta run she carried Australian Brumbies north and Indian produce and exotic animals on the southern run.
" Maiden voyage under the command of Commodore - Master Capt Colin McDonald, was Great Britain via Calcutta to her home port of Melbourne. 1913 Sold to British India S.N. Co with the rest of the Currie fleet.
" December 16th - Early in the morning while alongside the wharf in Sydney, Janus's cargo caught fire. The cargo in #1 hold was well ablaze and producing large quantities of smoke when the fire brigade arrived which hampered their efforts to find the seat of the fire. The brigade had to use smoke helmets and were pouring 1,000 gallons of water a minute into the hold in an attempt to control it. Eventually the blaze was extinguished with no structural damage to the ship. 1914 August 28th - Janus took fire in the Indian ocean, the blaze could not be controlled so Capt Colin McDonald made for Albany. She arrived at the port in a massive cloud of smoke, finally with the assistance of the port authorities (and the flooding of the hold) the fire was extinguished but not before causing considerable structural damage to the ship. Subsequently the vessel was repaired and placed back into service.
" With the outbreak of WWI Janus undertook trooping duties and the supply of military horses to both France and Mesopotamia. 1915 During the periods 1915-1916 and 1917-1918 Janus served as an Indian Expeditionary Force transport. 1919 Janus came under the Liner Requisition Scheme and was used to repatriate troops including the special wireless section from Mesopotamia. 1926 October 13th - Fire was discovered in #3 hold when the vessel was 60 miles west of Neptune Islands on route from Calcutta to Adelaide. Six hose lines were deployed and blazing material was thrown into the sea through the bulkhead cargo doors. After a seven hour battle the blaze was extinguished but not before considerable damage had been done to the ship. 1933 January 7th - Hull sunk as the inner core of a breakwater for that port.